Ho hum, another headline story in the NYTimes about the coming End of Days… I think that the paper’s elevation of Justin Gillis to a front-pager is a low point in their journalism not seen since they swallowed the WMD line of the Bush years, hook, line, and sinker. So, what do we have? Some scientists feel that the ice sheet covering the Antarctic land mass is moving towards irreversible “collapse” into the sea, and that this could raise the oceans by several feet. When will it happen? Maybe in a few centuries, and maybe in 1,000 years. And why is it happening? Not clear, but it has something to do with wind patterns in the Antarctic, and nothing to do with global warming…which isn’t happening at the south pole anyway. BTW, the amount of ice at the south pole has been steadily increasing each year and is at an all-time high right now. We could use a little ice melt. Antarctica ice mass is at an all time high…at least since we’ve been able to measure it via satellite. So, relax. Climate change is real but just not nearly as scary as these headlines make it out to be. Amazing how there is no mention in the article about the complete lack of warming in Antarctica and the record ice levels. But what do I know. I’m just an atmospheric scientist. As usual, the article identifies that the warming is coming from multiple sources, but fails to break down how much is from man-made causes. This is probably because they really don’t know. They are, at best, guesses. Remember that these models have been wildly inaccurate in the past. (I’m not being critical. This climate modeling stuff is extremely difficult, and some inputs into the models cannot be empirically determined.) So, given that we don’t know whether stopping all CO2 emissions 100% will make a difference, how much industry would you like to export to China and India? The evidence mounts. The planet Earth is warming. The consequences can seriously disrupt the human food supply and perhaps affect the ability of our species to reproduce. Can the plants and animals adapt with sufficient speed to survive? Can the wise ones (homo sapiens) adapt its complex carbon combustion lifestyle in time to save our own, or shall we go the way of the Dodo bird? 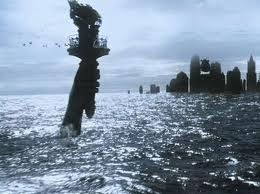 Chaos and war will sweep the planet when famine, disease, and economic collapse result from global warming. Reproduction of this image is prohibited, or at least that is the title of the painting by Magritte shown here. I guess I have involved myself in the sort of vicious logical cycle that he loved so much, and that he painted, by simply showing it here. Or buying it in a book, or on a postcard. Another one along the lines of “This is not a pipe.” A college friend of mine remarked of this painting, “What a nightmare – looking into a mirror and not being able to see your face!” Another interdiction. The book on the mantle, by the way, is Poe’s “Narrative of Arthur Gordon Pym”. That story dealt with unmentionables and things unseen and never seen – the ghastly horrors of the antarctic regions. Pym ends up there on a doomed sailing ship by way of shipwreck, psychopaths, and cannibalism. On expedition into the inland regions of the south, he meets his end, we think, at the hands of vicious natives. All chant, shout, and speak with horror the syllables, “Tekeli li!” What does it mean? The mere sight of the remains of the the huge urban settlements built by these creatures, with the realization that they are millions of years older than the oldest human city, and the eventual discovery that some of the inhabitants yet live, drives some of the explorers positively mad. 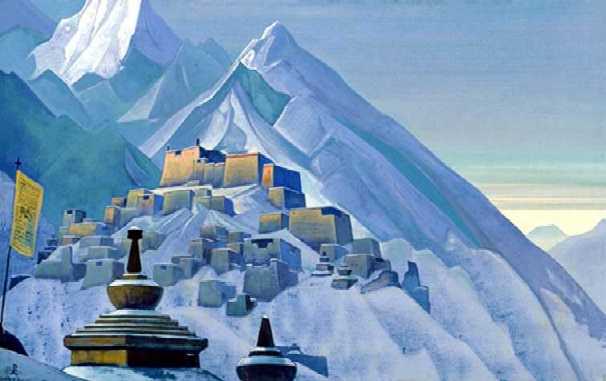 Lovecraft repeatedly mentions paintings by Nicholas Roerich (an early 20th century mystic and pacifist) to describe the appearance of the urban remains.